Are you frustrated taking so much time to warm up your baby bottle every day? As moms ourselves, we know how hard it can be to give up precious time when raising an infant. If this is you, you may want to consider investing in a bottle warmer. 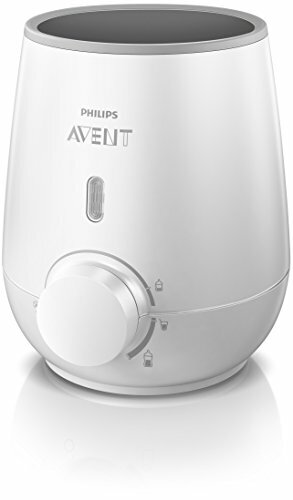 In today's article, we are reviewing the Philips AVENT Bottle Warmer. The Philips AVENT Bottle Warmer gently and evenly heats the bottle, so that there are no hot spots as the milk circulates during warming. This product works with all Philips AVENT bottles, toddler cups, and most food jars. This will heat four ounces of milk in three minutes. There is a defrost setting, which can be used for defrosting breast milk and baby food. The small design makes it easy to place this on the counter or nightstand. The power consumption of this product is 300W. There is also a 2 year warranty. As of this writing there were 934 customer comments and 286 answered questions for the Philips AVENT Bottle Warmer. I've read through the customer feedback, and then condensed the results into this review. I hope that this helps you when shopping for a baby bottle warmer. "It does warm the bottle but it does not have a timer on it. It is supposed to warm the bottle within 3 mins. I actually timed it with my phone to see if it worked since there was no timer on the warmer itself. And it was still cold when the 3 mins was up. But I did let it warm longer and it does warm, it just takes longer and has no timer. A timer would be nice to have on it. Because at 3am I am not thinking about how long the bottle warmer has been going." "You have to set a timer with some other method and then check if the milk has reached the desired temperature. In other words, this is no better than heating a pot of water. I noticed that the day care center for my grandson uses these and they are as frustrated as well. I would love to learn the logic behind omitting such a basic feature." The smooth and sleek design was a real winner for parents that makes this bottle warmer very easy to clean. Whenever you have crevices and angles, appliances will be harder to clean. Thankfully, that is not the case with this bottle warmer. The Philips AVENT Bottle Warmer had mixed reviews. Some liked it while many others wished it had a timer and thermostat. Many commented that without those two features, this bottle warmer was no better than using a stove pot. One good feature is that the sleek design makes it easy to clean. Some other brand name bottle warmers are extremely hard to clean. This one also seems to not leave residue like other bottle warmers do. I hope that my review of the Philips AVENT Bottle Warmer can help you deicide if this is the bottle warmer for you!